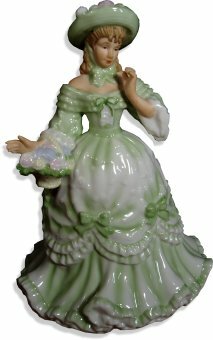 This elegant lady music box figurine is made from porcelain. She is fitted with a clockwork wound musical movement, which is fitted into the base. Once wound, the elegant lady musical figurine revolves to the music as it plays. Approx Size : 200 x 140mm (8" x 5 1/2"). Please note - although we take as much care as possible to show pictures of the actual Music Boxes and other range of products available, the designs & colours of Music Boxes or other products may vary slightly from those shown.